Happy Thanksgiving: Around 5pm yesterday Mendeley services ceased when all of our servers went offline simultaneously; we quickly realised that something was very wrong with our connection to them and this was confirmed by our hosting provider’s customer service calling us to let us know. The details are not completely clear at the moment however we do know that the data centre suffered a very serious power outage, and it appears that there were some faults with their back-up generator and batteries too. In summary, we didn’t have much influence: our servers were stuck in the data centre without power, unreachable for around 2 hours, due to issues sadly outside of our control. Please be aware that if you were syncing your data around 17:12 UTC yesterday then it would be worth checking everything is ok and contacting support if you are having any problems. As we are growing in size, we continuously work on scaling Mendeley further. However, yesterday’s combination of events borders on the absurd, and if it were a Mr Bean movie, it would have been funny. Our apologies that Mendeley was away for so long – we will surely have a word with our data center providers…Normal service has now resumed. Enjoy! In piphilology, one hundred thousand is the current world record for the number of digits of pi memorized by a human being (well, that’s according to Wikipedia). So, as happy as we are at Mendeley to have 100,000 users onboard, we regret to say that it is now beyond our limits for us to remember every single user on our site (but good to see that you keep on writing and helping to improve Mendeley). In the same week we crossed a second milestone of 8 million research articles uploaded to our database in less than a year. Currently Mendeley’s article database continues to expand as researchers, students and scientists from around the world upload, collaborate and share their research using Mendeley. In April 2009 we reached the 1 million article mark, which means the number of articles in our database has doubled in size every ten to twelve weeks. To give a little context: the world’s largest online research database by Thomson Reuters took 49 years to reach 40 million articles. A big thank you to Techcrunch’s Sean O’Hear who wrote: “Mendeley could be the largest online research paper database by early 2010” and James Glick from The Next Web who wrote: “Mendeley ‘the last.fm of research’ hits new heights”. And congratulations to our growing community of users! Hello – I’d like to give you a quick update on Mendeley Desktop as we work our way towards a ‘1.0’ release. We’ve been focusing on stability, making Mendeley easier to use and have improved collaborative working amongst other issues. To get feedback on our work in progress, we publish ‘development preview’ versions every few weeks which contain features and bug fixes that will appear in the next official release. If you would like to have an early look at what will be in the next version of Mendeley Desktop, you can download the latest development preview which is available on all platforms. We would greatly appreciate any feedback, good or bad, that you have. You can contact us about development releases by emailing support-dev@mendeley.com. Alternatively, you can use our feedback forums at http://feedback.mendeley.com (please mention which version you are using). These preview releases have not been tested as carefully as our official releases, so we advise users to backup their databases before trying out development preview versions of the client using Help -> Create Backup… in Mendeley Desktop. Improved support for concurrent updating of document details by users in shared groups. Tags and keywords changes are now merged correctly and conflict resolution is improved. Importer improvements. File attachments are now imported from EndNote XML files, more document types and fields are supported by the Bibtex and RIS importers. Mendeley is now able to guess the type of a file to import if it lacks the appropriate extension. The full text of HTML attachments is now searchable. Improved the stability of the file organiser and search features. Faster bibliography generation and citation insertion in Word and OpenOffice.org. For a complete list of changes since the previous development release and since the current stable release please see our release notes page. If you have suggestions for improvements please let us know by visiting the feedback forum. If you encounter any problems using Mendeley or have questions to ask please email support@mendeley.com. Back during the conceptual phase of the service, Jan, Paul, and Victor were thinking about what to call their product. The working name at the time was “Literacula”, because it sucked the metadata right out of PDFs. While this was a descriptive name, it was eventually decided that it was far too silly. No one would take them seriously with a silly name like that. What they needed was a distinguished name, a dignified one, steeped in the long history of science. Considering famous scientists through history and the work they’ve done, two names in particular came to mind. The first person, Mendeleev, was well known for being the one who started a systematization and organization of the elemental forms of matter, eventually coming up with the scaffold of the periodic table, which through its structure allowed patterns to be found and gaps in knowledge to be inferred. This sounded like just the sort of images they wanted to evoke. The next name was similar – Gregor Mendel, who, despite being a lone monk far from the official walls and financial support of of the academy, was able through careful and diligent study of the humble pea plant to uncover the rules of heredity, the foundation of genetics and one of the most important discoveries science has made to this day. This helped convey their strong support for open access and making the world’s knowledge available outside of institutional walls. Now, even though Mendeley seems like a distinguished and memorable name, some users – when they hear about “Mendeley” – accidentally misspell it slightly, which can lead to interesting results. So having had a look at our logs, and speaking from our own experience, here are the 5 most popular misspellings of Mendeley. Nominate Mendeley as Best International Startup at The Crunchies 2009! If we get nominated, everybody who voted for us can come to our office and get a kiss from our development team. If you don’t want a kiss, you can also rub their bellies, which brings good luck. Don’t let this chance get away! 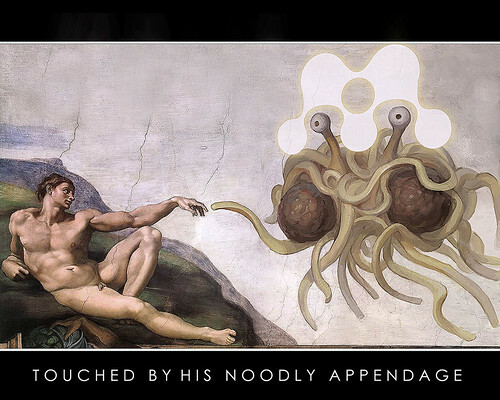 Here is an alternative version of Michelangelo’s fabled Flying Spaghetti Monster painting – this one includes His halo, shining a divine light on His Noodly Appendage. The halo looks otherworldly, yet eerily familiar. You can grab a larger version off the Mendeley Flickr account. Hat tip to Niklas Jansson, who was the first to be touched by His Noodly Appendage. Stanford vs Cambridge: The race is on! I was doing some research to see which universities have the most Mendeley users, when I thought it might be fun to see how these universities have grown day by day, over the last three months. The chart below shows just that: the top 10 Mendeley universities, and the growth in user base in each of these from August 1st to November 1st.